Well, the Marlin 917 Varmint Rifle was just the ticket to creating a new addiction in my life. I started going out doing a little small game hunting with a friend, so naturally, I had to look into all the newest, coolest tools of the trade. And one of the calibers and rifles I started seeing pop up nearly everywhere was the .17 HMR (Hornady Magnum Rifle) bullet, and the Marlin 917 series of rifles. And as regular visitors to this sight are aware of by now is that seeing is purchasing if I look long enough. So, after I continued to read about the Marlin 917, and the laser accuracy of the round, off I went to Academy Sports with debit card in hand to purchase my new rifle. I purchased the rifle for just over $200 and topped it off with a BSA Sweet 17 adjustable scope made just for this caliber. I had it bore sighted (which in the case of the guy at Academy meant he put it on), purchased some bullets and off I went to the gun club to try it out. Now everybody who visits here knows I am not a rifle guy. After the first $12.50 box of bullets, I hadn't even hit the 8x11 piece of paper the targets were on. So, what did I do? I reduced myself to reading the instructions. First adjustment, I started hitting the backstop where I could see how far off I was. I was shooting one foot left and 6" high. Second adjustment, 4 inches left and 4 inches high. Third adjustment, slightly right and a couple inches high. At that point, I realized I was about to get it with the Marlin 917 Varmint Rifle. 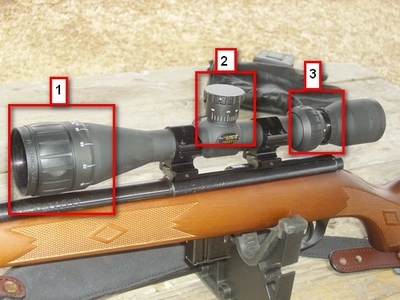 The Sweet 17 scope requires some reading if you are not familiar with adjustable scopes. The picture below shows most of the adjustments - Left to right: the focus and distance adjustments, elevation adjustment, and the zoom adjustment. 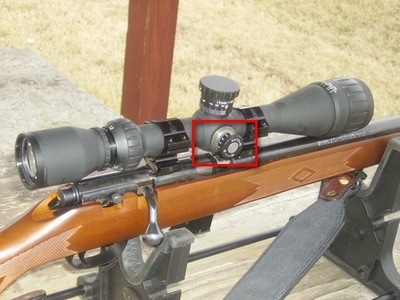 The picture below from the right side of the scope shows the windage adjustment which moves the point of aim 1/4" with each click. Once I figured the scope out and got it dialed in, I was able to appreciate the crystal clear optics that allowed me to see the tiny bullet holes clearly at the 100 yard mark. The gun sports a clean 22" bull barrel devoid of sights. You have to mount a scope on the gun for a sight. 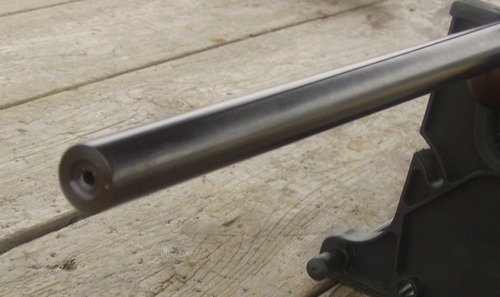 Below is a closeup picture of the gun's bolt action. It is fed from a detachable magazine and the gun comes with a 4 and 8 round magazine. On the first day I shot the Marlin 917 Varmint Rifle, [Update 2017 - now the Marlin XT 17V] it was sunny, about 50 degrees with a crosswind of about 12 mph. I was shooting Hornady Varmint Express 17 grain bullets from a bench rest. 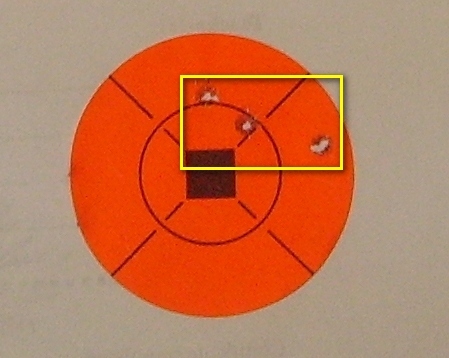 The target below shows common groups in a 2" target at 100 yards. The square I drew around the bullet holes represents a 1 inch area. Now to experienced sub-one inch shooters who shoot cluster holes at that distance, they would probably sneer at that group. But I find it remarkable. Not because it is great shooting but because this gun and scope combination allows a person with virtually no rifle/scope combination experience to shoot these kinds of groups at 100 yards right out of the box. That means what we have here is a great product at a reasonable, affordable price. The next time I shot the Marlin 917, the groups were more scattered on a cold, wet day with a 15 mile per hour cross wind and a wind chill factor of around 17 degrees. 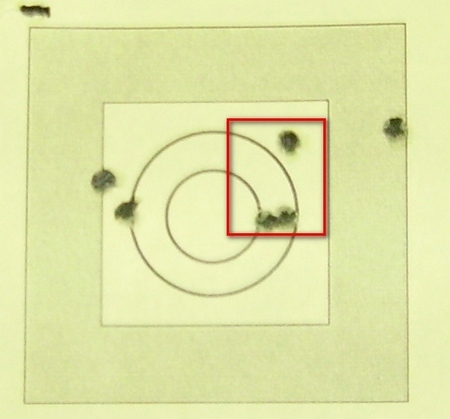 Below shows the groups in a 2" target with a square drawn around the closest 3 holes (about 1" apart). The scope had to be slightly redialed from the former session to get there. As a matter of practical accuracy, I hung up "Oscar", a picture of a prairie dog to see what I could do on a miserable day like that if I was actually hunting. 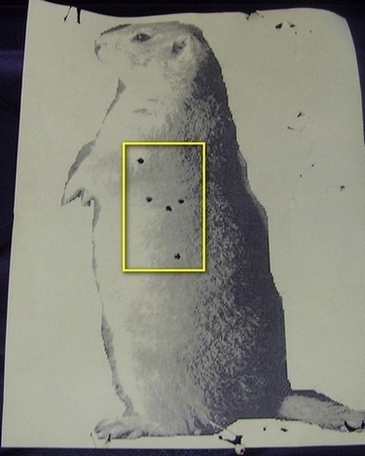 As you can see below, Oscar would have died on the spot with any of the shots with the ballistic tip bullets used. In my two practice sessions with the gun, I used the Hornady 17 HMR 17 grain V-MAX bullet and the Federal Hydrashock 17 grain bullets in the Hornady style bullet. Both rim fire rounds performed in similar fashion with no noticeable difference in accuracy. 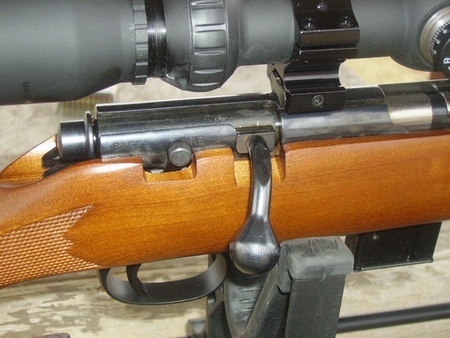 BOTTOM LINE: I am not a "rifleman", but after 2 sessions at the range, I had complete confidence that I could take this rifle and scope combination out and make humane kills of small game and varmints well beyond 100 yards. It is a great rifle and scope combo at a great price. The ammo is more expensive than .22 long rifle, but it is a dramatically more effective bullet. And, it's no more expensive than most popular target handgun ammo. With the combination of accuracy and dependability, the Marlin 917 Varmint Rifle and BSA Sweet 17 scope is an unbeatable value for a rifleman or hunter at any level of experience.